In this episode, SLUG’s Editorial Assistant Christian Schultz chats with Malinda Fisher of Desert Rose Jewelry and drummer Jeremy Devine about Diabolical Records’ Bandemonium, a musical celebration that brings together friends and acquaintances for a fun, spontaneous night of diverse talent. 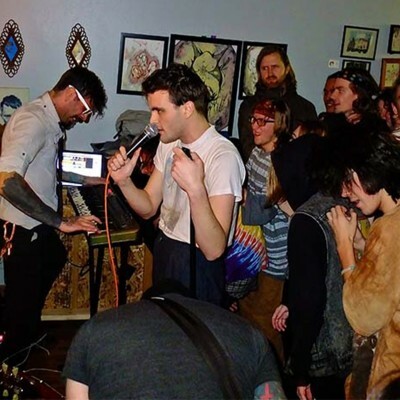 On December 26, 2014, dozens of Utah musicians gathered together at Diabolical Records for the inaugural Bandemonium, an event that featured one-time band line-ups randomly picked from a hat weeks prior. Over 70 local musicians signed up, forming groups that would later perform at the event. After the bands were set, their members chose names and had a few weeks to prepare a 10–15 minute set of music to perform live for their peers. Ranging from punk to electronic to folk to garage, the musical output of the night showcased the diversity, talent and community of the music scene that has found a home at Diabolical Records over the past two years. One of the most unique facets of Bandemonium is how it offers a space for established and amateur musicians to co-mingle. As the drummer for the bands Chalk and Foster Body, Devine enjoyed putting down the sticks and picking up another instrument, while Fisher enjoyed being a part of Salt Lake’s artistic community in a new way. Diabolical Records has cooked up a variety of ways to be an inclusive space for the community that it fosters, and Bandemonium is just one of the many that the shop offers. After another successful July 4th Bandemonium that included fireworks and a barbecue, the event is set to take place again on Saturday, Dec. 26, from 6 – 9 p.m. To find out more about Bandemonium, visit Diabolical Records’ Facebook page.